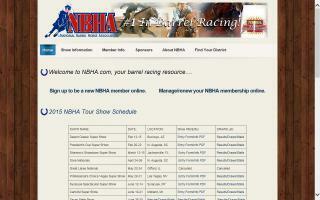 Barrel Racing Organizations Directory - O Horse! The National Barrel Horse Association is a world wide organization with local districts in your neighborhood. Massachusetts has MA00, MA01, MA02 Districts. Join us today. Dedicated to verifying, recording and preserving the earnings and pedigrees of barrel horses and riders. National Barrel Horse Association - NBHA California District 7 serves Sonoma, Marin, Mendocino, Lake, Napa and Humboldt counties.